8 Tips for Riding in Traffic | Hupy and Abraham, S.C.
With spring upon us and optimal riding conditions right around the corner, motorcyclists will once again be taking to the roadways across the country. As a rider, it is important to take all necessary precautions when riding and it is especially important to follow best practices while riding in and around traffic. 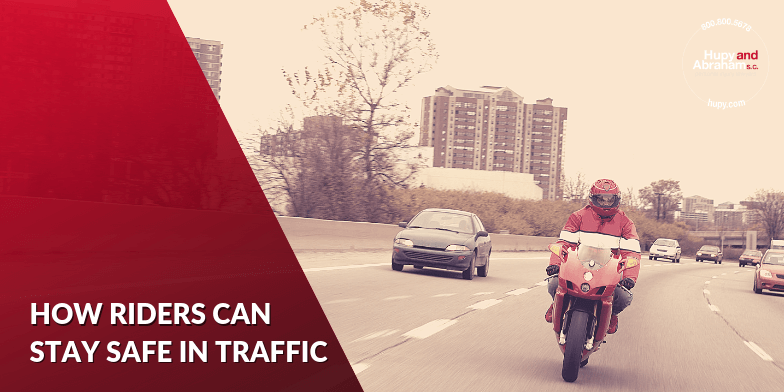 Congested roadways can be extremely dangerous for inexperienced riders and it’s important to know how to behave in high-traffic situations to stay safe. Following these eight tips could mean the difference between a safe ride and a serious accident. Watch other drivers: Take note of where other drivers are looking and try to position yourself to be seen in their mirrors. Cover your brakes: When driving in heavy traffic, people will often brake suddenly so it is important to keep your hand over the brake and be ready to bring yourself to a sudden stop if necessary. Make yourself seen: Using your high beam and wearing brightly colored reflective gear will help make sure you’re seen by drivers and pedestrians alike. Scan the environment: Keep an eye on the road conditions, other drivers, your mirrors and instruments. Try not to have your eyes dwell on a specific area for too long to ensure you get a full picture of your surroundings. Prepare to accelerate: Try to ride a gear lower than usual to ensure you’ll be able to accelerate out of danger when necessary. Remain aware of offramps: Don’t ever position yourself in between a vehicle and an offramp. A vehicle could fail to see you when moving over to take an exit ramp. Stay to the right or left when traffic slows: Don’t ride in the middle of your lane. Stay slightly to the left or right to ensure you have an escape route if traffic suddenly slows down. Ride in the open: When possible, ride in more open areas of the road to prevent getting closed in by other drivers. It’s impossible to control what other drivers will do on the roads, but you can always control what you do and how you can keep yourself safe. If the terrible event occurs that you or a loved one has been injured in a motorcycle accident, it is important to seek legal representation with the law firm that has helped thousands of injured bikers. Don’t wait, contact Hupy and Abraham at 800-800-5678 or via online chat 24/7 at hupy.com to start discussing your options and building your case.